TORONTO, ON – Mr. Jane and Finch will make its world broadcast and streaming premiere on CBC POV and CBC Gems on February 22, 2019 @ 9pm/EST during Black History month on CBC. The world festival premiere is at the 7th annual Toronto Black Film Festival, February 17th @ 5pm. The unconventional political documentary directed, co-written and co-produced by Ngardy Conteh George is produced by the Oya Media Group founded by Alison Duke and Ngardy Conteh George. The producers also added to their creative force, iconic music composer, Juno Award winner and Platinum selling record producer, Orin Isaacs. 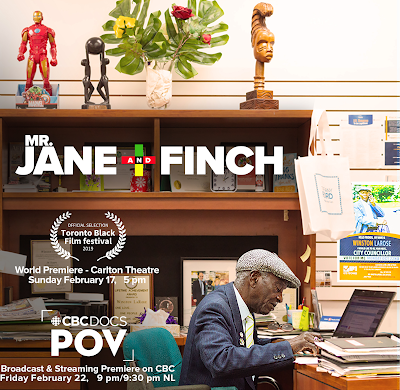 The film takes up the journey of 80-year-old community activist, Winston LaRose, affectionately known as Mr. Jane and Finch. It gives an insider look into the controversial 2018 Toronto municipal elections and the man that ran with his heart. LaRose fears politicians wish to push out long-standing residents and change the makeup of the Jane and Finch landscape. The community activist believes he can upset the status quo by throwing his hat into the political ring. When Doug Ford drastically changes things by cutting the number of city councillors, LaRose must fight to keep his disintegrating team together, inspire a non-voting demographic, and empower the people of his beloved Jane and Finch community.